So I’ve officially started my Bread Bible Studies. And I’ve specifically started with the easier recipes in the first chapter. Quick breads, biscuits, popovers, they seem like things that I should be able to achieve given my general level of kitchen competence. One thing I’ve noticed about Rose’s recipes is that I really need to read through them completely a few times before I start weighing, mixing, and baking. And I also need to pay attention to whether I’m working in cups, ounces, or grams. Because on more than one occasion I’ve discovered that even though I’m working in grams, I’m looking at the weights listed in ounces. And the two are definitely not the same. I don’t even want to imagine what the end result would be to using 5 grams of flour when I should be using 150 grams. 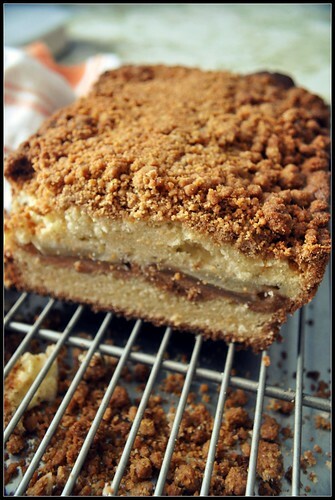 Talk about a (Cinnamon Crumb) Surprise. I find that as I’m working through Rose’s recipes, I often start talking to her as though she were standing next to me in the kitchen. “Really, you want me to do what?” is one of my usual outbursts. Because for some reason, her process isn’t intuitive to me. Why wouldn’t I go ahead and put the flour into the sugar mixture that gets used as both a filling and a topping? Fortunately I put on the brakes before the butter was added to everything…like I said, since the process isn’t intuitive to me, it’s really in my best interest to make sure I’ve read through the recipe a couple of times before I jump in. I wish I could say this first Bread Bible project was a smashing success. I was very confident as I mixed and beat and poured. The batter, that I licked off the spatula, was rich and thick with a lovely hint of sweetness. It reminded me of Cake Batter ice cream that Cold Stone Creamery sells…and that’s some good stuff. My expectations were high. But what I pulled out of the oven an hour later just didn’t make me happy. The bottom and sides developed a thick, dry crust. The layer of cake under the apples was firm and perfect and tight while the layer above the apples was tunneled and airy. And the topping? It was burnt. I take full responsibility for that one. The recipe calls for walnuts, which I can’t eat. So I figured I needed to replace them with something or else the rest of the topping recipe wouldn’t work as intended because the ratios would be wrong. So instead of 85 grams of walnuts, I used 85 grams of graham cracker crumbs. I think my instincts were partly right to make a substitution. But they were partly wrong not to consider that the crumbs might not stand up so well to an hour in the oven. So at the risk of committing a Mortal Sin, I think I might like this recipe better if I made some changes. Instead of a layer of thin apples in the middle, why can’t I mix diced apples through all of the batter? Since the graham cracker crumb top didn’t work so well, what about an oatmeal crumb instead? And does a quick bread HAVE to be baked in a loaf pan? I’ve got a mind to try this in a 9 inch cake pan, or as cupcakes, just for kicks. Because if I’m going to go to hell for disrespecting the Bread Bible, I better make it worth my while. Wendi, Making substitutions is all part of the process! I like the idea of using oatmeal in place of the nuts/graham cracker crumbs. It would be like the topping on a fruit crisp, which I love, yum! What are you going to make next from the Bread Bible? Jen, it just feels like a sin to say that I want to monkey with one of Rose’s recipes. Thankfully, cooking is not like organized religion and I don’t need to actually confess my kitchen sins in order to avoid eternal damnation. I’ve been totally slacking on my Bread Bible Studies of late. I need to pull the book off the shelf and see if Rose can’t guide me to better breads. As you know, I can’t bake to save my life. And, like you, I’m always tempted to tinker with the recipe! I look forward to more baking adventures! Kitch, would you believe I actually broke a bread recipe? Swear to god. Sometimes I believe I am a danger to myself and others when I go into the kitchen! I don’t believe that you actually *broke* a recipe. Doesn’t seem possible! Beth, you would not believe what goes on behind the curtain in my kitchen. The post about how I broke the challah is scheduled for next month. WordPress redesigned their default page so I decided to freshen things up a bit. The bad thing is that all the changes get made in real time. So I do apologize for any wonkyness that y’all may experience as I get things just so. Love the new look and I’ll just be pulling up a chair to your Bread Bible Study! I know I don’t have the time to invest in working out all these recipes, but I’m sure I’ll learn something from watching you!! Kristin, I am often a cautionary tale of what not to do ; ) As I say, my home cooking is full of teachable moments. Thankfully, my Bread Bible Study is not nearly as regimented as other organized study groups. I’m really liking the new theme that WordPress rolled out. They make it so easy to blog without having to understand things like CSS, self hosting, code, blah, blah, blah. While I have the deepest respect and admiration for folks who can get their hands dirty with those things, it’s just not for me. You’re too funny! That’s why we have a “Tech guy” ie…Chris Ann’s husband. We are totally techie geek challenged!